Bonsai wire comes in a range of thicknesses which may vary from 6mm to 1mm. Both Aluminium and copper wire are commonly used. Aluminium is a good wire to start with as it is easy to apply and relatively inexpensive. The wire is annealed (heat treated) to soften it. The wire will harden once applied to your tree which will give it extra holding ability. The wire is too open, and will not have sufficient holding power. Before you start on your prized bonsai get some practice on a garden shrub first. You can always reuse the wire, if it gets too hard heating in a fire will usually soften it again wait until it cools of course. Test the twig for resistance then coil at a 45 degree angle up the branch. It should be tight enough to make contact with the bark all the way around, but no tighter. Bend the twig to see if the wire is strong enough to hold it. Before long you will be able to assess what thickness of wire to use for any given thickness of branch. For demonstration purposes we will use this pine. This tree has been pruned to shape with a new apex formed and all unnessersary branches removed. It has been in this training pot for six months now. If it was left as it is it would for a reasonable formal upright with time. The section between the two branches at the apex and the third branch down is too large and could only be remedied by removing the top. With wire we may be able to hide that defect. Start by judging whether the wire is thick enough to do the job required of it. You can use two pieces of wire wound along side each other if necessary. Cut a piece of wire about one third longer than the trunk. Anchor the wire by pushing one end into the soil at the base of the trunk, right to the bottom if using only a shallow dish. With one hand, hold the wire firmly to the base of the trunk. With the other hand, begin to coil the wire at a 45 degree angle. After each turn, move the hand that is keeping the wire taut upwards so it follows the spiral as it coils up the trunk. 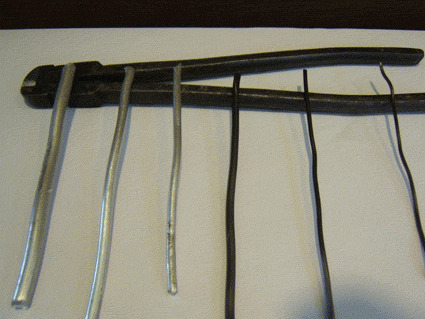 If the trunk becomes too thin for the wire you're using, change to a finer strand. Follow the thicker wire up the trunk for at least two turns before continuing to the top. Bend the trunk with both hands, using your thumbs as fulcrums. Make the curves narrower towards the top. Remember, a tree is three-dimensional, so it should be equally bent backwards and fowards as well as from side to side. Try to create any bends with a single smooth movement continual readjustment will damage the bark. Notice how the finer wire at the top follows the thicker wire for at least two full turns to anchor it in place. You need to work out a strategy in advance. Wherever it is possible try to use one piece of wire for two branches. This will not work if the branches directly oppose one another. Remember work outwards from the trunk, keep it neat and don't cross over wires. The first photo shows our tree with the wire for the first primary branches locked in. The second photo gives you a clearer picture of how to lock two branches in. Make sure you have at least one twist around the truck before you start on the second branch. If this twist isn't present you will get movement in the first branch when you try to adjust the second. IF you can't use two branches secure the wire by coiling it around the trunk with at least two turns. With the primary branches in place move on to the secondary smaller branches. Much the same system is used for the secondary barnches as the primary. Always make sure your wire is secured by coiling it around another primary or secondary branch. What you don't want is movement in the branch you have already set when you try to adjust the one opposite. Be careful if you are wiring soft growth, leave the wire a bit loose in these areas. Try to avoide needles or foliage as you move up the branch. As you can see the tree now has some movement and foliage gaps are filled. The length of time the wire must stay on the tree before the branch sets will vary from tree to tree and variety to variety. There is, however, one hazard that is best avoided. As the branch grows it will thicken and eventually begin to bite into the bark. This can happen in just a few weeks so be vigilant. As soon as you notice this starting cut the wire away. Don't try to save wire by uncoiling it. It will be much firmer when you remove it than it was when it went on. When I was first starting out I broke more branches trying to save 50 cents worth of wire than I did bending the branch in the first place. Cut each coil with a sharp pair of wire cutters and it will fall away in links.